Healthy living can help prevent some of the leading causes of death for men. Even the smallest changes, like eating a balanced diet, including plenty of fruits and vegetables and less saturated fat and some form of daily exercise, may reduce your risk of cancer and other chronic diseases — putting you on the path to a longer, healthier life. Unlike women, men are often unlikely to seek out medical help until a health issue is out of hand. From infancy to old age, women are simply healthier than men. Out of the 15 leading causes of death, men lead women in all of them except Alzheimer’s disease. While the reasons are partly biological, men’s approach to their health plays a role too. They simply tend to put their health last. They call it atherosclerosis or “hardening of the arteries could easily be “a man’s worst enemy.” In general, heart disease and stroke are the first and second leading cause of death worldwide, for both men and women. One in five men and women will die from cardiovascular disease and according to research men’s arteries tend to develop atherosclerosis earlier than women’s. Men’s average age for death from cardiovascular disease is under 65, while for women it is about six years later. 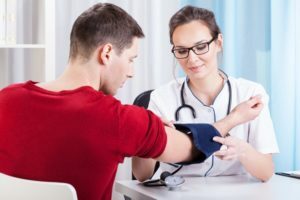 So, all the more important for men to get cholesterol checked at least every five years, control blood pressure, get some physical activity in daily and eat for fruits and vegetables and less saturated or trans fats. Many prostate cancers are slow-growing and unlikely to spread, while others are aggressive, so it is imperative for men to get an annual blood test for prostate specific antigen (PSA). Although older age is a risk factor for prostate cancer, younger men should not be complacent. As much as 30% of prostate cancers occur in men under age 65. Lung cancer is the leading cancer killer of both men and women, claiming more lives than prostate, colon, and breast cancer combined. The good news is that rate of new lung cancer cases has been dropping steadily with the drop in the prevalence of the use of tobacco products by men. Depression isn’t just a bad mood, a rough patch, or the blues. It’s an emotional disturbance that affects your whole body and overall health, signaling that brain chemicals and stress hormones are out of balance. Experts previously thought depression affected far more women than men. But that may just be men’s tendency to hide depressed feelings or express them in ways different than women’s. Men are four times more likely to commit suicide compared to women due to under diagnosed depression in men.